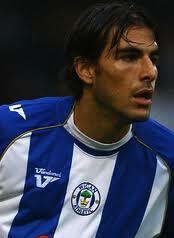 Will Jordi Gomez be willing to take a pay cut to rejoin Latics? So said Gary Caldwell, giving a public show of support to the players he signed. But the question is: how many of them will be a success in the Championship? One player who has been a success in that division is Jordi Gomez. He was voted Player of the Season for Latics in 2013-14 after scoring 11 goals in 43 appearances. Gomez had received a similar award at Swansea in 2008-09, when the Welsh club was in the Championship division. Should Gomez return he will have to take a sizeable pay cut. He is on Premier League wages at Sunderland and any offer from Latics is likely to fall short even of the figure he had been on when he left Wigan in the summer of 2014. However, it could be that Sunderland are willing to continue to pay Gomez a fraction of his wages for the coming season in a bid to move him on. In his heart of hearts Caldwell surely knows that some of his current squad will fall short in the higher division. With the players due back for training in just over a week he will be keen to finalise deals for new players who he believes can be successful in the Championship. But his problem is doing so within a tight budget for a wage bill that will not be supported by parachute payments a year from now. One year contracts for experienced players in their thirties is a viable option, providing Caldwell can beat off opposition from other clubs willing to offer contracts of longer duration or of more money. The latest rumour is that Latics are looking at the 35 year old Leon Osman, released by Everton. Transfer rumours abound at this time of year and it is never easy to sift through them to ascertain which are realistic. However, given Latics’ recruitment policy it is unlikely that they will look at signing two other Sunderland players whose names have been mentioned through the social media. Caldwell will be searching for another centre forward but is unlikely to be able offer the right kind of terms for Danny Graham (30) or Steven Fletcher (29). Last season’s recruitment process involved largely focusing on players out of contract or available at knock-down prices. Indeed the Player of the Season, David Perkins, was recruited when his contract with Blackpool terminated. Moreover Max Power, who finished in second place in the voting, was also a free agent although Latics had to pay compensation to Tranmere Rovers because of his age. Rumours suggest that Latics are currently interested in free agents John McGinn (23, right back, Dundee), Curtis Nelson (25, central defender, Plymouth Argyle) and Alex Gilbey (21, midfielder, Colchester United). However, David Sharpe has backed Caldwell in paying serious money when a player has become available who could serve the club for years to come. Around £900,000 was spent on Will Grigg and £600,000 for Yanic Wildschut, both in their early to mid-twenties. Latics have reputedly made bids over £500,000 for 25 year old Barnsley midfielder Conor Hourihane and 28 year old Aberdeen winger Jonny Hayes. The latter would be a surprise, given the player’s age. Last summer Caldwell had a budget advantage over rival managers in League 1. The reverse is the case this summer, with so many Championship clubs having parachute payments exceeding those of Latics in terms of size and longevity. Moreover the budget that Caldwell has is not sustainable beyond one more year. Caldwell and his recruitment team will continue to focus on picking up younger players who are out of contract or available at bargain prices. But funds will be available for signing young players who represent good value for the future and can add value in the coming season. Caldwell will also ensure that an age balance is maintained by bringing in quality players in the latter stages of their careers on shorter contracts. We can expect Caldwell to be increasingly active in the transfer market over the coming week as the pre-season training date comes closer and closer. ← Can Latics afford to keep Chris McCann?